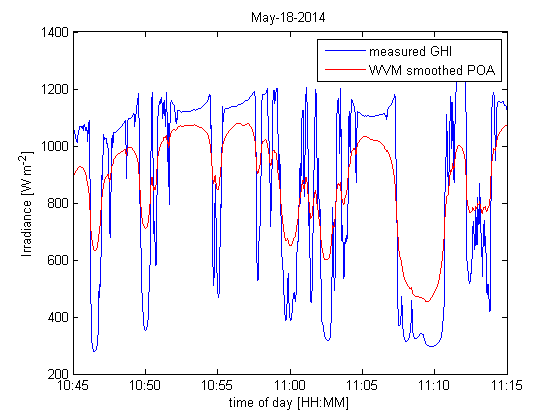 This example uses May 18th, 2014 irradiance data collected at Sandia National Laboratories in Livermore, CA to demonstrate use of the wavelet variability model (WVM). This file contains two vectors: “GHI” which is the GHI measurements, and “dt” which is the timestamps. Also load the discrete points latitudes and longitudes. First, define the irradiance sensor variables. Then define the PV plant details. %We do not need to define plantinfo.MW or plantinfo.PVdensity for the 'discrete' case. Finally, define the cloud speed. Zoomed out plot comparing the measured GHI to the WVM output of smoothed POA irradiance. 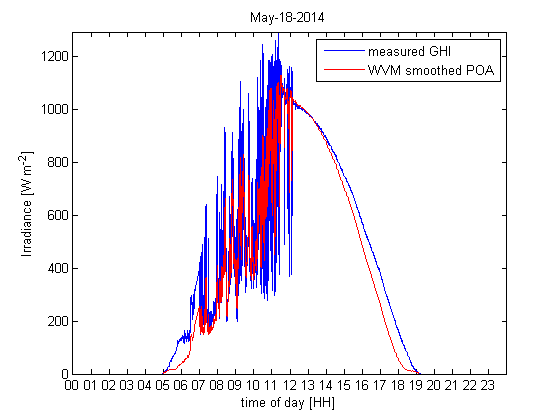 Zoomed in plot comparing the measured GHI to the WVM output of smoothed POA irradiance.